Senator Elizabeth Warren says she picked up a lot of her feistiness from reading Nancy Drew novels as a kid. Today she believes the most important mystery to solve is how to get the American economy working for someone other than billionaires. It's a message she's been taking all over the country, and she isn't afraid to call banks, credit card companies and some employers cheats and tricksters. "The biggest financial institutions figured out they could make a lot of money by cheating people on mortgages, credit cards and payday loans," she told a packed auditorium at the Graduate Center of the City University of New York, where she spoke alongside New York Times (NYT) columnist Paul Krugman. The Democrat from Massachusetts even said the market is broken in many regards. "This is about getting markets to work for real people," she said. The biggest applause of the night was on three issues that come up frequently in Warren's speeches. 1) Financial regulation: Warren was the driving force behind the creation of the Consumer Financial Protection Bureau after the 2008 financial crisis. The agency has returned billions of dollars to Americans who were wronged. "Traffic works better with traffic lights," she explained. In her eyes, a true capitalist system would have transparency so consumers could make informed choices. But in a world of "mice type" with pages and pages of fine print that no one reads or understands, the market breaks down. 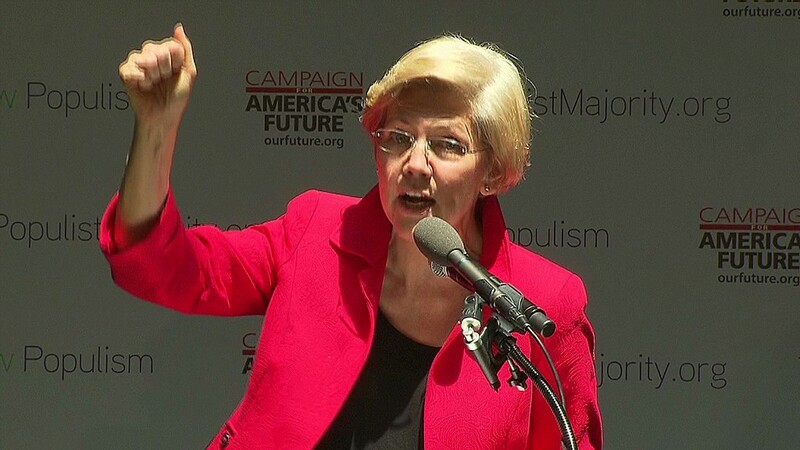 2) Reducing student loans: Last summer Warren made headlines for arguing that student loans should have the same interest rates that banks get when they borrow money from the Federal Reserve. This year she's pushing to allow people to re-finance their student loans at the historically low rates currently in place. As she likes to remind people, "Student loans issued from 2007 to 2012 are on target to produce $66 billion in profit for the United States government." 3) Raising the minimum wage: "No one should work full time and still live in poverty," Warren said. She uses her own family story to illustrate how critical it is for workers to make a living wage. Her father had a heart attack when she was 12, and her mother had to go back to work in retail at Sears (SHLD) to support the family. Related: Could Senator Warren have made it in today's America? That would be much harder today because a woman working a minimum wage job and trying to support even one child would likely still be in poverty. Her other big push is for basic worker rights, including allowing workers to talk freely about how much they make and forcing employers that call shift workers in for only a few hours to pay them for at least four hours of work. Plenty of critics paint Warren as a socialist, but she has her message down. "We can't have a market that functions unless we have a government that functions. That's the heart of it," she said.